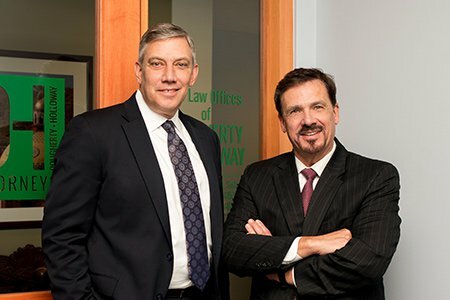 Ed Dougherty and Phil Holloway joined together to form Dougherty & Holloway, LLC after working for separate law firms. Both have extensive experience in personal injury and wrongful death claims and both have achieved millions of dollars in verdicts and settlements for their clients. Our Kansas City accident lawyers are committed to obtaining the money you need to cover your medical expenses, lost wages, pain and suffering, and other expenses associated with your accident. We understand that this may be one of the most difficult times in your life and we are here to help you get through it. When you work with us, your case becomes our priority. We take the time to learn about how your accident has changed your life and the lives of your family members. If you have been affected by a motorcycle accident, semi-truck accident, highway and guardrail accident, brain injury, product defect, slip and fall, medical malpractice, nursing home neglect, construction site accident, wrongful death or other personal injuries you deserve to be compensated. We know that money cannot replace your health or wellbeing or the life of a family member. We are committed to helping our clients get on with their lives after an accident, and full and fair compensation is central to this. We can help you to hold the negligent parties accountable and to obtain full and fair compensation for your losses. If your insurance company is unwilling to compromise, we are not afraid to take your case to court. We have years of experience in negotiating with insurance carriers. We understand the tactics they use to avoid paying the full cost of your injuries and we know how to counter those tactics effectively. If your insurance company is unwilling to compromise, we are not afraid to take your case to court. We practice with the highest ethical and professional standards, and we have been successful in recovering millions of dollars in compensation for our clients. It can enable you to manage your injuries and to maintain your quality of life, while providing financial support for your family, despite a loss of income. Call our office or contact us online to learn more about how we can help you. We are available 24 hours a day, seven days a week, and we offer evening and weekend appointments. We will come to your home or visit you in the hospital if necessary. You will never be charged a fee unless you receive compensation for your injuries. Spanish translation services are available upon request.